You are here: Home / Health and Beauty / Do I Really Need a Cordless Waterpik Water Flosser? 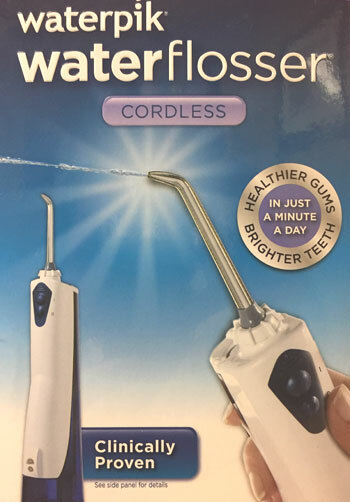 Do I Really Need a Cordless Waterpik Water Flosser? On the last post, I wrote about my disappointment to Tom’s of Maine aluminum-free deodorant. I have a similar experience again to share with you. This time it has something to do with dental hygiene. Ever since I moved to Canada, I became meticulous with my dental hygiene. It’s ridiculously expensive to have any dental-related procedure especially if you don’t have a health insurance like Blue Cross or Green Shield. I already have an Oral B Braun electric toothbrush that I use at least twice a day. But I could do more with a water flosser. Yes. It’s a thing. Water flosser is a floss but you use water instead. Simple right. But why do I need it anyway? In my first dental appointment this year (I go twice a year) for teeth cleaning (oral prophylaxis). It turned out that my teeth have no tartar; the result was attributed to my habit of using electric toothbrush and flossing. But plaque plagued my teeth like barnacles clinging to a wooden post in a shore. My dental hygienist advice me to use Waterpik Water Flosser. I have a budget for my dental expenses so there’s no question on whether I’ll go overboard or not and it’s not that expensive to boot. I bought the cordless Waterpik Water Flosser (Model WP-360, $50 ish) and 3 brush head ($25) for my electric toothbrush at Superstore. Will it work? Or fail me like the Tom’s of Maine deodorant. I hope it’s the former. Before purchasing anything, I can’t decide whether to buy the cordless Waterpik or the one with a bigger water tank but with a cord. The latter is expensive so I went for the affordable version. You know what they say. You get what you paid for. It didn’t work well as I expected. I had to refill 3 times. I overestimated it’s capacity to hold water. This disappointment is something I can deal with. The huge drawback that cause regret to my meticulous, teeth-obsessed soul is the low pressure of water. I was expecting a powerful force to knock out the build up of plaque on my teeth. Although, Waterpik comes with 2 nozzles, I still get the same failed result. Not the same Waterpik I bought. I’m wondering if I should get the bigger version, better read a lot of reviews about it first so I wouldn’t make the same mistake even if my dental budget is stuffed. One more thing. Using a water flosser is a mess. You have to lean a bit forward in the sink but not too close to the mirror. It’s nasty the first time I tried it. Water from my mouth splashed onto the mirror while I seemed to drool with water. My apologies to a repulsive imagery lingering in your mind. Reliving such experience made me realize that I don’t want a messy dental hygiene. For now, I’m fine with my electric toothbrush, floss, and mouthwash. In the future, I want to try a teeth whitening LED light kit and airfloss. What dental hygiene you can’t do away with even if you hate it so much? Any recommendations for a waterflosser or should I forget about it? PREVIOUS: Did I Stink Using Tom’s of Maine Aluminum-Free Deodorant?